Super Bowl parties are a great excuse to do some home entertaining. They're also a great way to combine groups of friends, work friends, college friends, and neighborhood friends can all effortlessly make connections because there's one unifying purpose in the party. Because Super Bowl parties are usually held at home they're also a great way to let your friends with and without kids mix and mingle. Although for a Super Bowl party the game is the big entertainment, that doesn't mean that other entertainment wouldn't be appreciated, especially by younger guests. 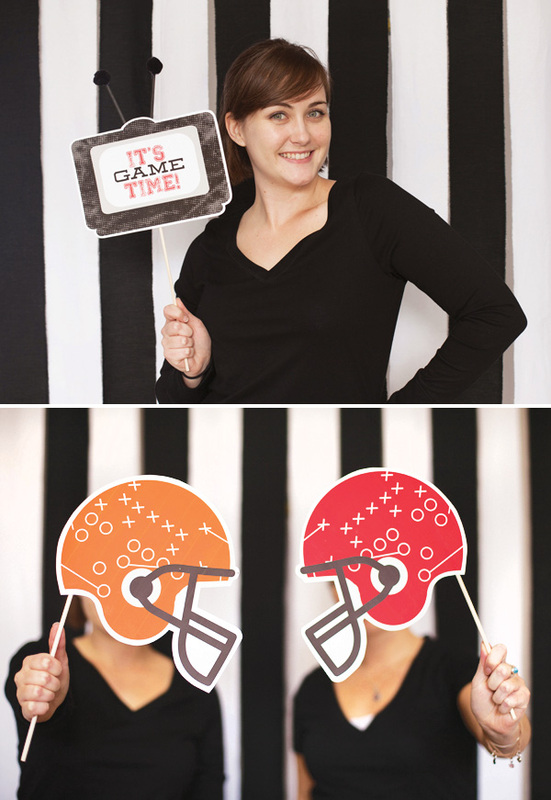 Think about hiring or constructing an open-air photo booth with plenty of football themed props. The props below come from Hostess with the Mostess. A Karaoke machine would let you produce your own half-time show. Hiring a caricature artist for an hour would provide surprisingly affordable mementos of the party enjoyed by kids or adults alike. If you live in a warm weather area, a bounce house will help keep kids out of the house and occupied. Unlike at most grown-up parties, for a Super Bowl party the biggest TV in the house will be the center of attention for the adults. Turning a second gathering place into a "Kids Only Zone" will make young guests and their parents feel welcome. If that second area has a TV it would be best not to have that TV turned to the game. Kids who want to watch the game should watch it with adults. This allows adults to monitor the ads and half-time show content and decide if it's appropriate for their child. Having a kid-friendly movie on the second TV will be appreciated by those kids not interested in football. The easiest activity to provide kids during the party is a collection of coloring sheets, these can be easily found online. However, most kids will also grow tired of coloring fairly quickly. 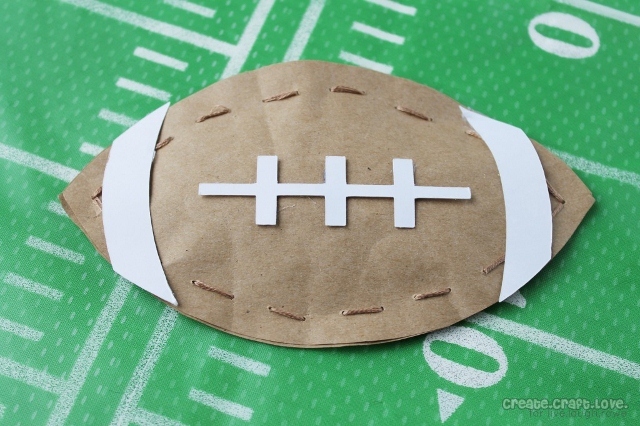 CraftJr.com has a great selection of football crafts. If you're expecting a few older kids, putting them to work helping the younger ones will keep everyone occupied. 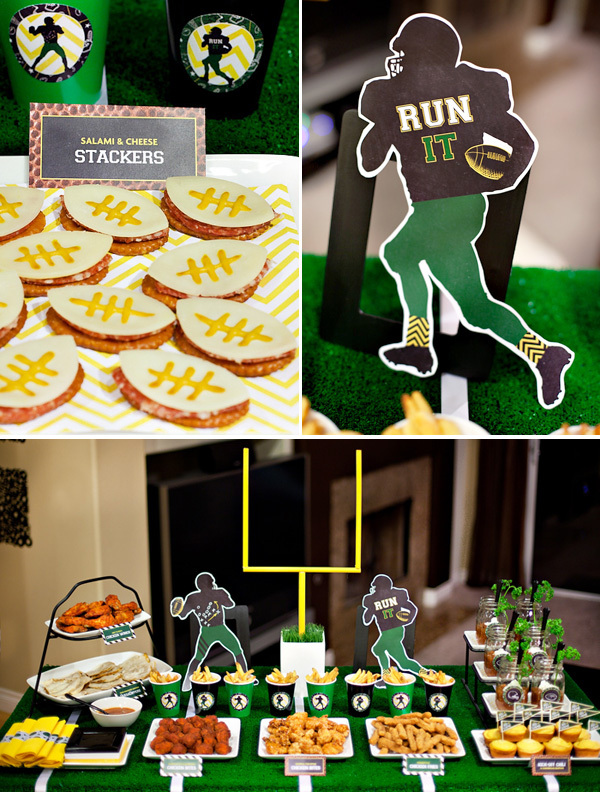 Football themed snacks, like these from Hostess with the Mostess will keep kids and adults happy during the game.